Sheila Gabay, Lloyd Arvedon, Frank Merblum, John Stiefel, Victor King, and Doug Doub. Merblum-Doub, Gabay-King, and Arvedon-Stiefel have all played together for years. Virgile-Weiss and Fontaine-Greer have played quite a bit lately, but aren't longstanding pairs. Although outnumbered, Weiss started the match with a 25 imp carryover from way back in the round robin stage. All five partnerships employ a standard framework, but with variations in style and gadgetry. Merblum-Doub use 12-14 notrumps, everybody else 15-17. At both tables, 2NT was a game raise of hearts. The minor suit cards are all offside for this normal contract, but North is in danger of being endplayed. In fact, the game can always be made if West declares, but that's impossible to do in most systems. Virgile led a killing diamond against Stiefel, who finessed the queen. When he got in, declarer drew trumps, knocked out the SA, and eliminated the pointed suits, but these moves were transparent to Weiss, who ducked when Stiefel led a club to the king, since he'd be endplayed if he won the trick. Down one. At most tables in a pair game, this auction would be three passes, followed by 1NT-3NT, and the field would divide between North-South +600 on a heart lead or +630 on a club lead. I can't criticize Virgile-Weiss for not finding 3NT with no heart stopper after Arvedon's tactical third seat opening. However, North can also make four spades - if the defense leads three rounds of hearts, declarer just pitches his club loser. Weiss took a deep position by passing the North cards. Against 1H, he led the CK, SK, S to SA, trying to get Virgile to play a diamond. But Bob returned a passive heart. Arvedon drew trumps and knocked out the CA. Weiss didn't find a diamond shift either, so Arvedon pitched diamonds on clubs and scored 80, a seemingly good result. However, the ugly Merblum-Doub auction (remember, they play 12-14 notrumps) resulted in a poor five club contract down 2 for 200, for three imps to Weiss and a 28-0 lead after counting the 25-imp carryover. East-West can make three diamonds by guessing the diamond ten. However, if Stiefel had balanced with a double over 2H, surely Arvedon would try 2S, and Weiss could defeat that contract by leading his singleton diamond and getting two ruffs. However, I think Virgile would have taken the push to 3H when 2S was passed back to him. Anyway, Stiefel sold out to 2H, and all the defense could get was three spades, a trump and a club for minus 110. Weiss won Stiefel's spade lead, led a club to dummy's ace, and passed the C10, more for avoidance than because of restricted choice. When Stiefel got in with his HK, he could see that Weiss had at least ten tricks, possibly eleven on a squeeze, so he tried laying down the SA. Weiss claimed 660. Both 3NT and 4S are marginal games East-West, below 50% vulnerable at imps. Fontaine's conservatism proved justified in spades, as Doub led the H10 and later got in with his DA to give Merblum a ruff to hold the contract to 140. There was no misinterpretation of 4NT at either table. Merblum's was quantitative, Weiss's was 1430 for spades. West led a small diamond against Doub's 4NT. Declarer won dummy's DK, unblocked his hearts, and ran 12 tricks for 490. I really like Weiss's 6S bid. He knows the defenders may have a hard time finding the club lead he fears. Even if he is off CAK, dummy might have the red suit strength to throw four clubs away. Stiefel led a diamond. Arvedon won his ace and could have put Weiss to the test by means of a spectacular shift to the CK, but why should he do that? After all, Weiss's chunky blocking hearts were concealed, and the hand might be on a losing club finesse if Weiss's hand were, say, S-AKQJxx H-A D-K C-QJxxx. Arvedon played a passive trump, and Weiss, like Doub, powered across the goal line. Suppose the defense did attack clubs. How would the various slams fare? 6NT by North can be defeated by any club lead, but 12 tricks are available in 6NT by South against any of West's opening lead choices except a spectacular club king! (The spectacular CK switch after cashing the DA fails to defeat 6NT double dummy. Declarer can win the CA, cash the DQ to pitch a club, and run five spades for a non-simultaneous double squeeze with clubs the anchor suit. Work it out. The opening CK lead is necessary to both block the hearts and break up the squeeze. If declarer wins to play a diamond, West wins and returns the club deuce. So long as East clutches his four hearts forever, declarer will come up short.) The same squeeze would be available in 6S if Arvedon had found the CK shift at trick 2. Everybody's 4H was cold. Stiefel snagged an overtrick to win an imp over Greer and trail 64-6. North can defeat 3NT with a low diamond lead and pinpoint defense thereafter. If declarer doesn't duck twice in diamonds, South can use his two spade entries to set up three diamond tricks in time. If declarer ducks twice in diamonds, dummy must find painful pitches. The clubs have to stay, and if either discard is a heart, any heart switch is effective. If dummy parts with two spades, keeping all four hearts, North needs to switch carefully to a heart honor. Dummy has to win, and when declarer crosses to his CK, if he doesn't cash the DA, he won't get it, but if he does cash it, dummy is squeezed. Both Wests stretched a bit to game-raise hearts. Although Stiefel's slam try got him dangerously high, I agree with it. A club was led, but one of the queens dropped and declarer scored 650. Greer was safe in 4H, but after winning the club lead and drawing trumps, he played three rounds of diamonds. South cashed a club and on the spade shift, declarer misguessed, putting up the jack for a mere 620 to lose an imp, for 67-41. Virgile won Arvedon's spade lead with dummy's king, cashed the two top clubs, getting the bad news, and took a losing heart finesse. He scored 2 spades, 2 clubs, 2 hearts, and 3 diamonds, for plus 400. Pretty chicken bidding by the Norths, if you ask me. Compare Board 23 with Board 5. Again, I suspect inadequate agreements played a role. Weiss's 4NT was 1430 for clubs. Presumably, he discounted any possibility of a no-keys vulnerable 3C, and was only bidding slam if Virgile had C-AK. West led a diamond, and Virgile hopped dummy's ace, picked up trumps, and trumped spades good to take all the tricks, +640. This 4H contract won't be made against any good defense. For example, a spade lead ducked dooms declarer to losing two aces, the HK, and a ruff. In practice, both Easts led the DK to dummy's ace. If declarer had used this entry to lead up in spades, the same duck by West defeats the hand the same way. However, both declarers tried a heart finesse. Gabay ran the HJ to the HK, ruffed the next diamond, drew trumps, and led the CK. East won the CA and continued clubs. When Gabay led a spade from dummy, Fontaine ducked, and declarer had to lose two spades in the end for -50. Against King, Fontaine led his DK, and after drawing trumps, declarer took a spade finesse and the defense cashed its four tricks. 140 looked like a plus position, as 4C can be made the other way. Our Norths were going to be safe enough in 1S or 2C until the Souths inserted voluntary but unwelcome 2D bids, at which point there was risk of -500. King escaped when Fontaine elected to declare hearts for 140. In fact, in this entire 64 board match, the Merblum team never played any doubled contract. Gabay led a diamond, and Jim Greer made short work of his slam - three rounds of diamonds for a ruff, HA, HQ pitching clubs, get back in and draw trumps, cross to the CK to ditch the last club on the HJ for 1430. Fontaine led the HJ, ducked to Greer's king. Greer's trump return ran to dummy's C8. Gabay cashed DA, SA, DK, SK, and tried to pitch a spade on the HQ - if it lived, she could claim on a high crossruff. But Greer ruffed for down one. Doub made 180 when North-South never found their spades. Greer settled for the 120 he was entitled to. Two imps to Merblum, and the third quarter ended with the score 120-81. The Merblum team won the third quarter 31-19. The boards had been swingy, although the score didn't really reflect this. Doub's opening lead on Board 40 alone swung 22 imps, and the Merblum team missed other slam swing chances. 39 imps is not an insuperable lead to overcome in 16 boards, but time was running out. Merblum could not afford to let any more chances slip by in the fourth quarter. 7D by East would receive top score in a single-dummy bidding contest, since it will make around 70% of the time. All Doub really needed was for spades to come in for five tricks. Fontaine led the C10. Doub played it correctly, I think: CA, DK, DA (noting the bad but not fatal trump split), CK, C ruff, DJ, SQ, DQ pitching a heart from dummy, spade up. Rats! Heart discard by Fontaine. North had sluffed three hearts on the second, third, and fourth trumps. It was pretty clear that North started with 4513 distribution, so had Doub been in only 6D, he could make it by just ducking this trick to North. Perhaps he should have done that anyway for down one, but there was a chance North's hearts had been headed by the KJ and he had been squeezed down to KJ bare, or that South had just erred and discarded from H-Jxx. So Doub took a heart finesse, but Fontaine won and cashed two annoying clubs for down 3. Doub stole the pot for 3C. Fontaine led the SK, and declarer went down four, -200. Everybody threw in the last board, ending the match with a whimper. A partscore duel would probably have resulted in North-South making around 110 in clubs or spades. The Weiss team won the 64 boards by 32 points, 128-96, which with the 25 imp carryover, made the margin 57, 153-96. This keeps intact my streak - no GNT match I have kibitzed has ever been decided by the carryover. 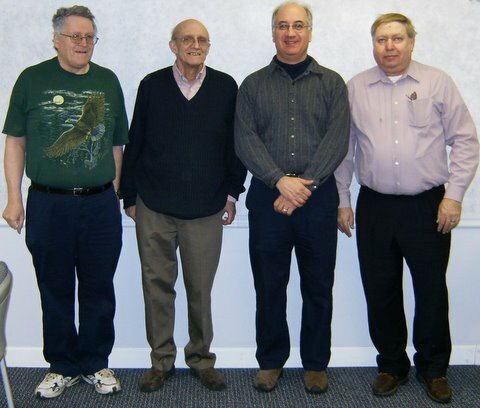 The 2009 Superflight Final was an impressive display by Richard Weiss, Bob Virgile, Walter Fontaine, and Jim Greer. None of them was perfect, but they played steady bridge and clearly outbid and outplayed their opponents. Playing four-handed through the round-robin plus two tiring 64-board knockout matches convinced the winners to augment their team to six for the nationals. In the tradition of excellent New England sportsmanship, they asked Merblum-Doub to join their team, and the offer was accepted. I wish all six of them luck in Washington DC this summer. I would like to thank the players for letting me watch, and also those who helped fix errata in the first draft. Remaining errors are mine.